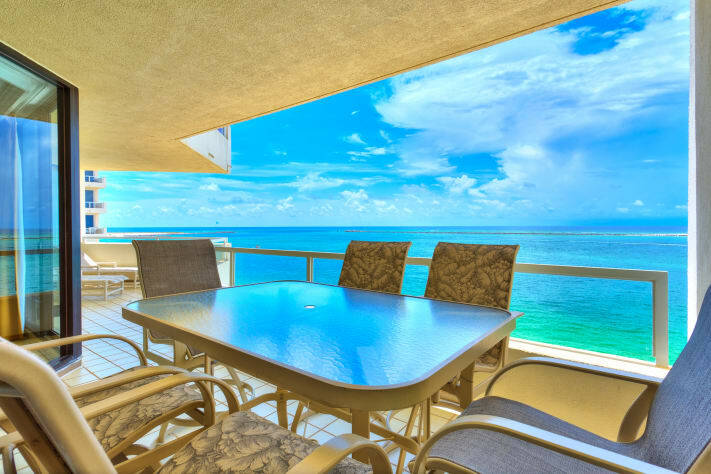 Welcome to our piece of paradise -you won’t beat the views from our condo! 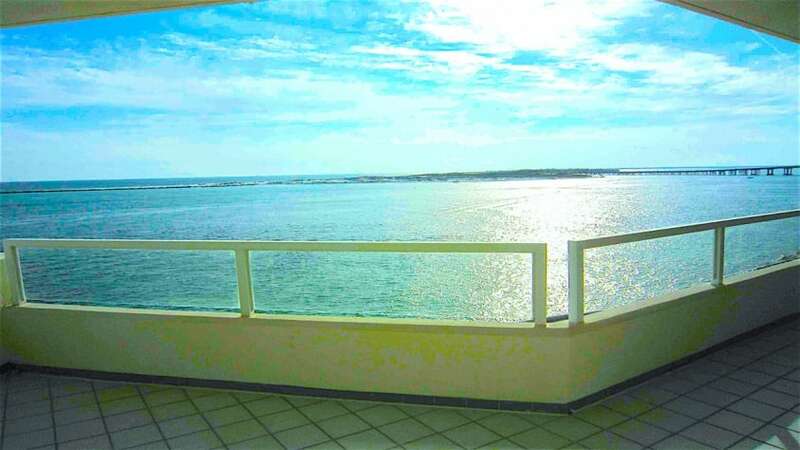 Our extra large (2100sq ft) condo faces the ocean rather than the less private harbor and the views are amazing – the best views in the building. 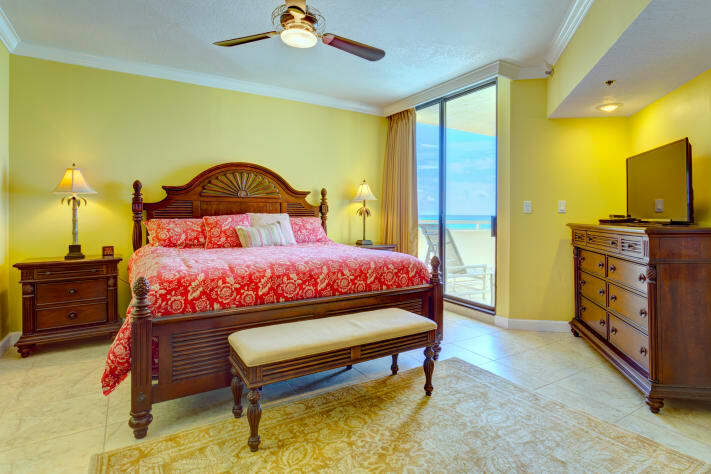 The direct ocean front views are seen from our living room, kitchen, family room and all 3 bedrooms as well as both of our over-sized balconies. Our completely renovated condo includes all the conveniences of home - we have gone the extra mile to make sure we provide you with everything you could require. 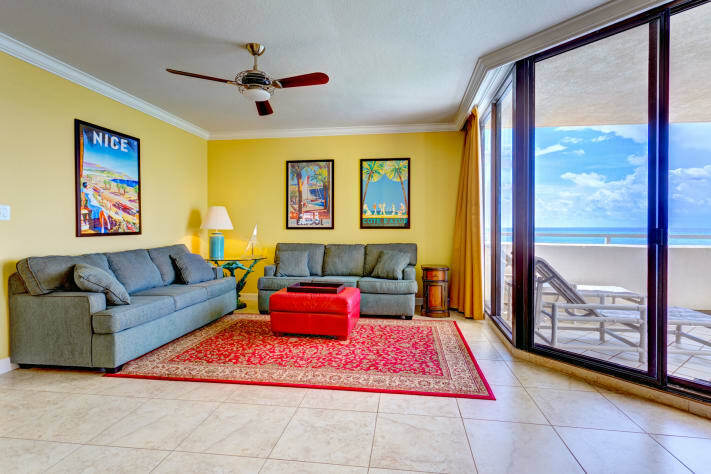 Our open concept main living area provides you with ocean views from all angles. We designed our kitchen with entertaining in mind including an extra large breakfast bar with seating for 8, granite counters, custom cabinets, tray ceiling, travertine back splash, stainless appliances, Hansgrohe faucet and many extras including electric kettle, toaster oven and upscale cookware. Our large dining area includes solid teak seating for 8 as well as a dry bar storage area with wine rack. 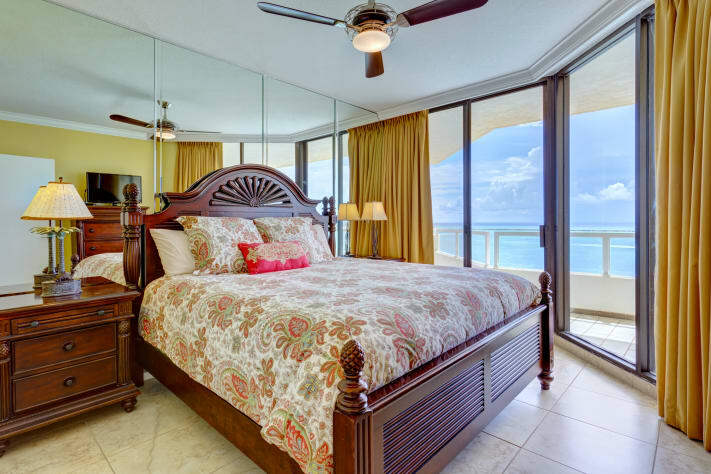 The condo is furnished in the Tommy Bahama Caribbean style with upgraded furnishings. Every window has custom black out drapes. In our living room relax on our extra large sectional in order to take in the ocean view or enjoy the oversized LED flatscreen TV. Walk out onto Balcony 1 with gulf views and the pool area below. An additional seating area is provided in the family room area adjoining the kitchen. 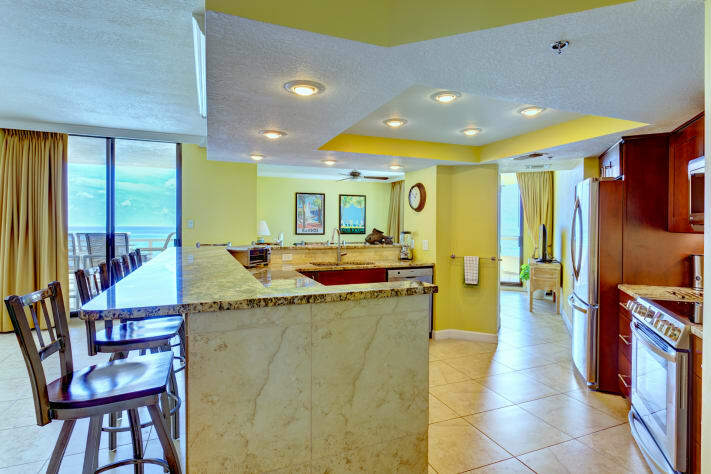 This area also has an LED flatscreen TV, superb ocean views and walk-out access to Balcony 2. 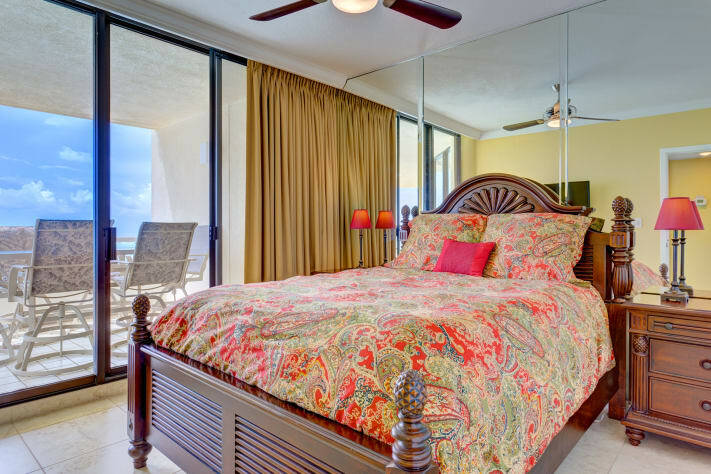 The master bedroom and 2nd bedroom both have king sized beds and there is a queen bed in the 3rd bedroom. 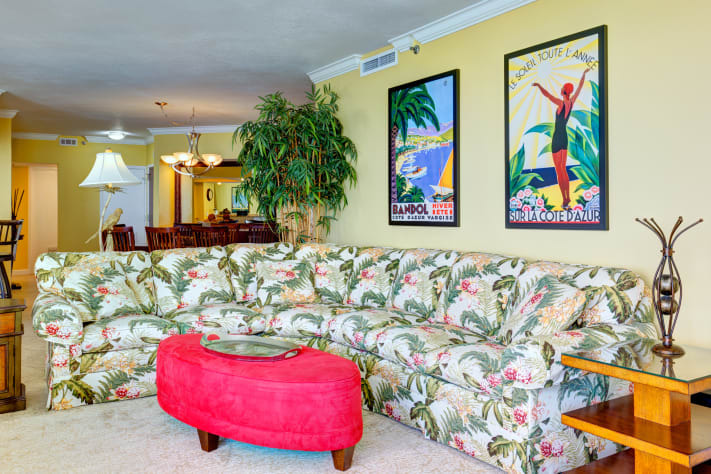 There is also a queen sized sleeper sofa in the family room – the condo can easily sleep 8. All bedrooms have luxury pillow-top mattresses, anti-allergy duvets and LED TVs. Blu-ray DVD players are also provided in the living room, family room, master-bedroom and bedroom 2. We have also provided free wireless internet access. 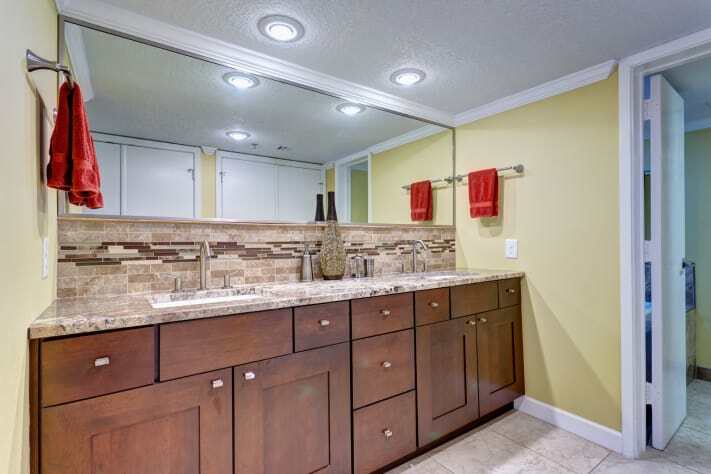 The master bathroom has a walk-in tiled shower stall, separate tub, and 2 sinks. 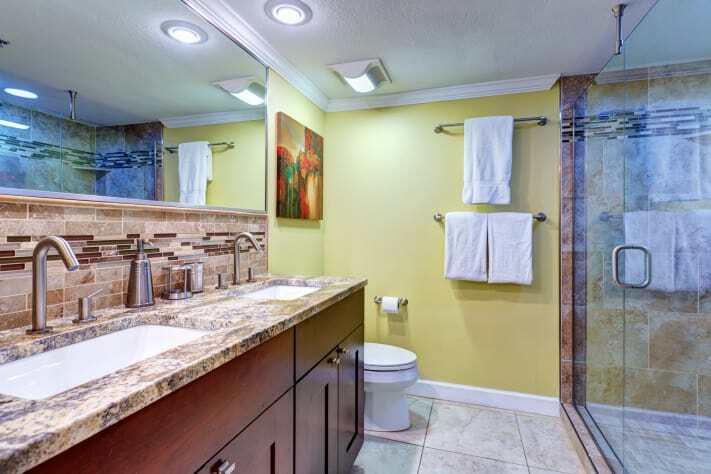 The guest bathroom includes has an oversized walk-in tiled shower and 2 sinks. There is also an additional half bathroom. 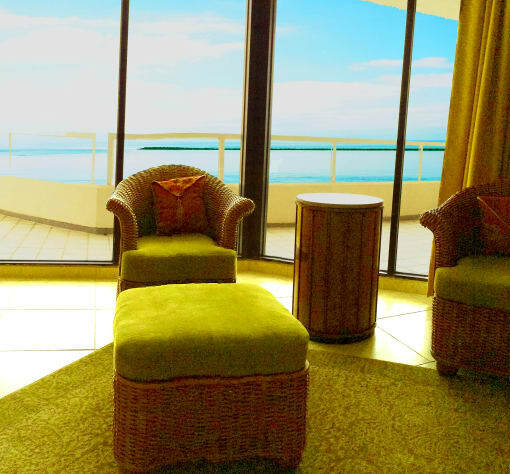 Enjoy incredible views from either of our 2 large balconies. 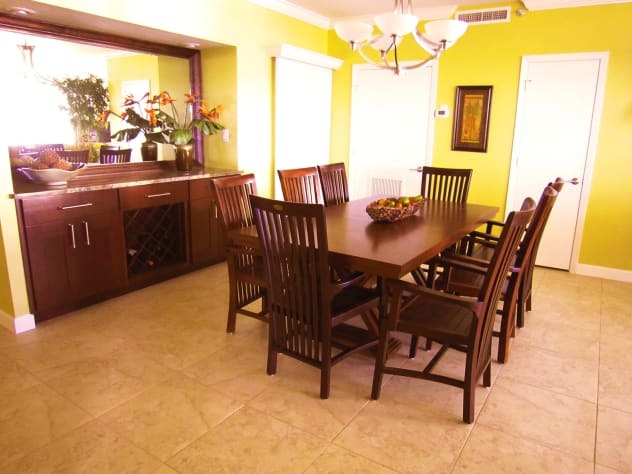 Each is furnished with a table and 6 bar height chairs and additional lounge chairs (4 total). 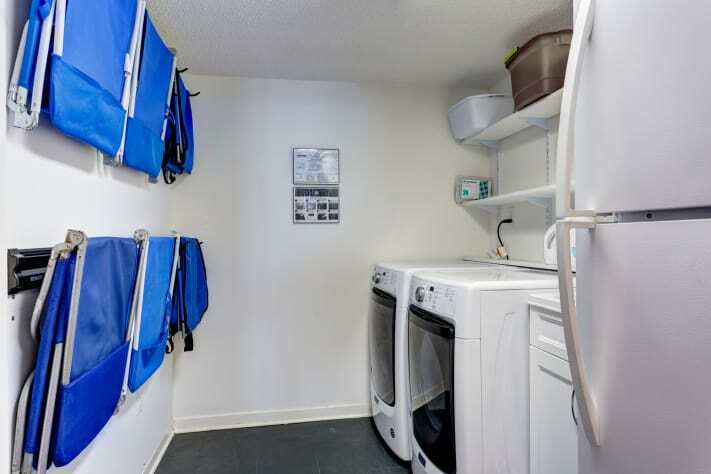 Our condo also includes our own laundry room which houses a full size washer and dryer as well as an additional refrigerator. Immediately adjoining our building you can take a walk in the sand to watch the pelicans and herons or take a swim in the ocean. Longer walk/jog trail starts at the front of our building and take you to the miles of sugar white sand of the main Destin beach. Take a water taxi or a 3 min drive to the harbor which offers some of the best eateries and bars in Florida. 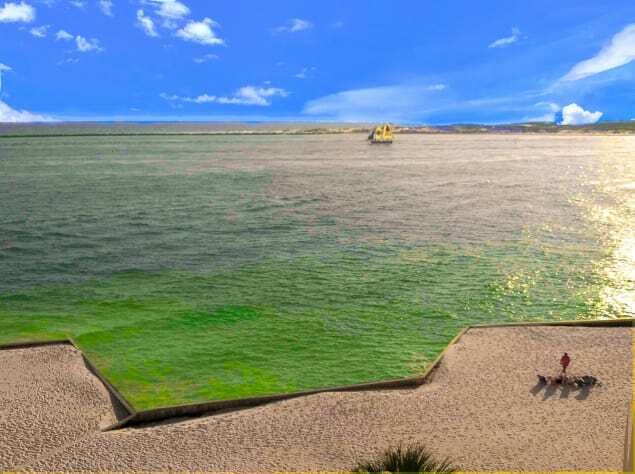 Here you can also watch the largest fishing fleet in Florida sail by or rent Pontoon boats, jet skis, fishing boats or take a dolphin cruise. If you are bringing your own boat you can also rent a boat slip at the East Pass Yacht Club. We are also just 5 minutes away from Big Kahuna water park which includes go karts, miniature golf, and much more. Destin is a Golfer’s Paradise, with hundreds of holes for your enjoyment. From the World Class Sandestin Golf and Beach Resort courses that host the PGA Seniors Championship, to local public courses that will challenge your handicap. Just a short drive down Hwy 98 are some great shopping opportunities including Silver Sands Outlet Mall, Destin Commons, and The Town Square in Sandestin Golf and Beach Resort. Email us now to reserve your time in paradise. Sat to Sat weekly rentals only in peak seasons. Main renter must be over 25. Building bylaws prohibit renters with pets. This is a no smoking property including balconies. Half of the total amount is required to secure the rental. Then the remainder is due one month before arrival. We accept credit cards (Visa, Mastercard & Discovery only) or personal checks. We really enjoyed our stay at this condo. It has everything that you want and need. Out each deck the views are beautiful. Really enjoyed our stay. We were able to rent a boat slip in the marina and have our boat close to be able to enjoy all Destin Harbor has to offer. Easy access for the water taxi to pick you and your family up and take you to any restaurant in the Harbor. Fantastic views and great patio. Owner was very easy to work with. Recommended for: Families with Young Children, Tourists without a Car. The condo was great and the views are spectacular. You cant find a better place to watch the sunset. The condo is huge and has plenty of room for 8 people. Building is not very crowded and neither is the beach. I would definitely stay here again. Recommended for: Families with Young Children, Sightseeing, Girls Getaway, Age 55+, Romantic Getaway, Families with Teenagers. This was our first trip to Destin and it was awesome. The condo is super nice and it has more than enough room for 4 adults and 4 children. The balconies were huge and the views are wonderful. The kids really enjoyed the pool. The laundry room and extra refrigerator were surprisingly handy. I was a little worried about the trek to the adjoining public beach but it really wasn't that far or that crowded. Perfect for our beginner swimmers and full of ocean life. I felt sorry for the hermit crabs but they all made it back home by the time we left for the day :). We would definitely like stay here again when we come back! This condo is beautiful! You can't beat the views and the two large balconies allow you to enjoy them fully. The condo is spacious and has everything you need. It is beautifully decorated and very well-maintained. The pool is very nice as well. It was great to be able to watch the fireworks right from our balcony! The owner was organized and made the entire process seamless. I would highly recommend staying here! Recommended for: Families with Young Children, Age 55+. This place is very nice and roomy. The view is fantastic. We really enjoyed our stay. 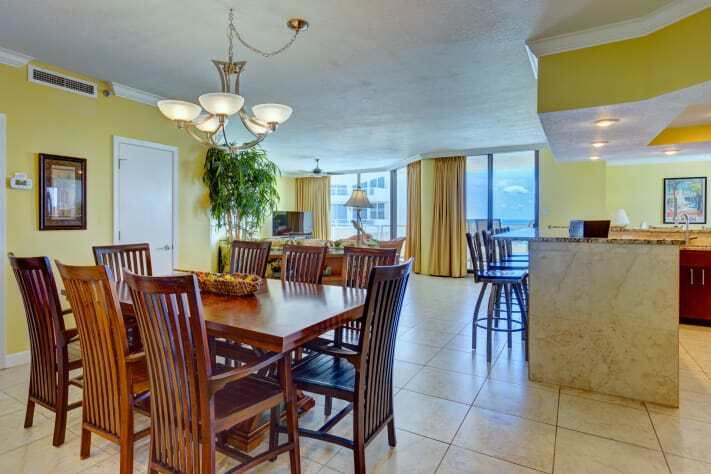 We will definitely rent this condo again when we come back to Destin. We had a great time the place was very nice and very comfy. We will be back next year for sure. I could not ask for a better place and location for Destin . Ms. Catherine is very easy to work with and very professional. We have been coming down to Destin for the past 20yrs or so and this place is the best place we have stayed at. We did not want to leave:). Recommended for: Families with Young Children, Sightseeing, Girls Getaway, Tourists without a Car, Age 55+, Romantic Getaway, Families with Teenagers. We have been coming to Destin for the past 20 years and have never stayed on Holiday Isle. I wish we had investigated this area sooner. Came down for a relaxing Mother/Daughter and friend vacation before she started her Senior year of High School. I was afraid 2 teenage girls might be bored, but they loved every minute of it. The way the condo was layed out, there was plenty of room for everyone, lots of TV's, so next time I hope to bring more of our family because it has 2 separate family rooms. The kitchen was absolutely fabulous where we actually stayed in a couple evenings and cooked so we could just sit and eat on the balcony and enjoy the view. The place was very quiet, we had the beach area almost to ourselves, took the water taxi in the evening over to the Harbor Walk. The girls took the water taxi over to rent Paddle Boards one afternoon, while I walked down a little further to the end of the island to swim. I cannot wait to come back again, but from the look of things, it looks booked until January. Owner was very easy to get in touch with, so everything was perfect. Recommended for: Girls Getaway, Age 55+, Families with Teenagers. We just got home from our 3rd trip to this awesome condo and had a fantastic time with our kids and grandkids. Plenty of room and everything is 1st class. If your stay includes a Thursday you are in luck due to the fireworks and air show that happens right off the balcony. This place has all that you need for a great stay. We will be back. Recommended for: People with Disabilities, Families with Young Children, Sightseeing, Girls Getaway, Tourists without a Car, Adventure Seekers, Age 55+, Romantic Getaway, Families with Teenagers. Spent a week in Destin and we certainly chose the right accommodation. This condo is huge and in a perfect location. 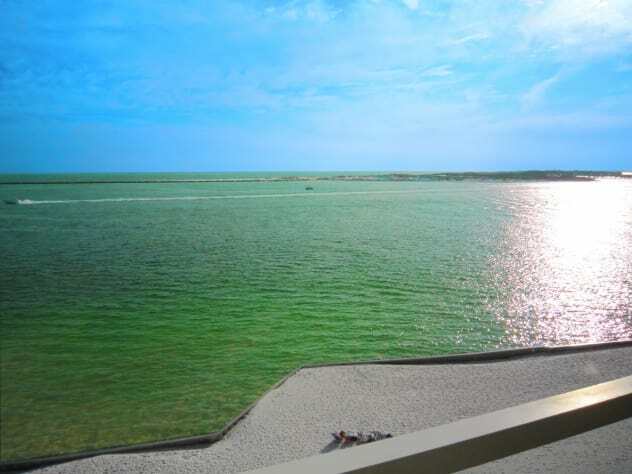 The views of the Gulf of Mexico, East Pass and the bay toward Crab Island are spectacular. If not for the allure of the beach and Destin, we might have been content to spend 7 days without ever leaving the condo. This place is really nice...the master bath 'rain shower' alone was worth the price of admission. The master bed was way too firm/hard for my comfort, but I lean toward a soft bed anyway. TV's everywhere!!! The kitchen is perfect for cooking meals and we were not lacking for anything...even found an ice cream scoop. The convenience of the water taxi cannot be overstated, especially considering the sometimes difficult evening parking availability at Harborwalk. (mornings are ok for parking) Just be sure to call ahead for the taxi. Eating suggestions: AJ's and La Paz. If you are going to rent kayaks, waverunners or a pontoon boat, look no farther than Luther's. They were very service oriented and even met us at the car to help unload our things. Wanting fresh seafood to cook? Go to Sexton's market and you will not be disappointed...take cash because they don't take credit cards. Back to the condo...Catherine was great to work with throughout this process. This place was worth every bit of our 9-hour drive. Seriously considering a return trip...might fly next time though. Each year we love staying here at the East Pass Condo's, next to Noriega Point. We love staying here and spending each day on the whitest beaches on the Gulf & snorkeling in the crystal clear waters. 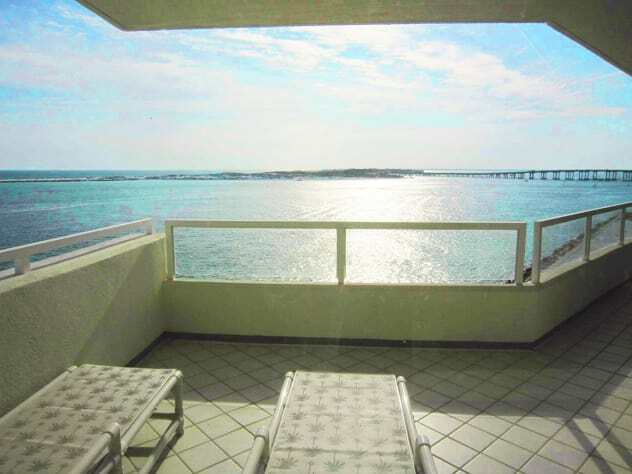 This 5th floor unit has beautiful views of the gulf from 5 different rooms. 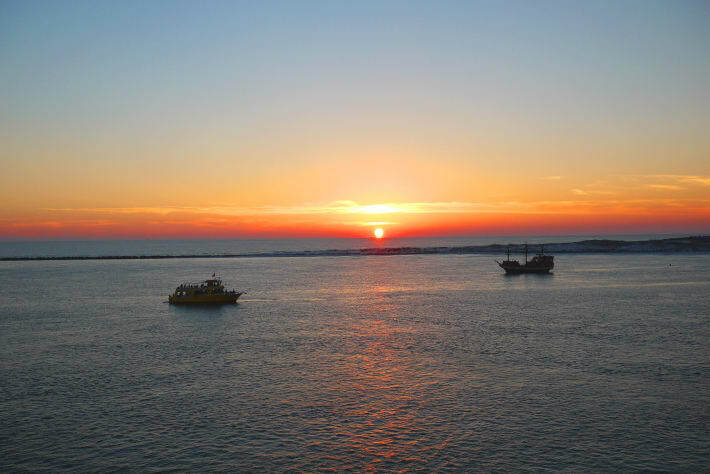 We especially enjoy watching the many fishing boats leaving the harbor each morning heading out into the Gulf of Mexico and then returning in the afternoon. It is truly a beautiful and relaxing site to watch from any of the many balconies in this unit. This condo is so spacious, it has 3 large bedrooms, a huge kitchen with stainless steel appliances, 2 large walk -in showers, 5 TV's, & laundry room with extra refrigerator. And there are so many great restaurants to dine at too! It's a little hard to sort through the many restaurants, but one bit of advice is to skip the chains. Our favorites are: Louisiana Lagniappe, Dewey Destin's, Bayou Bill's Crab House, The Red Bar in Grayton Beach and a homemade desert from the Donut Hole Restaurant. Recommended for: Age 55+, Families with Teenagers. Enjoyed our visit to this beautiful condo with an awesome view. Loved watching the boats go by in the early morning while drinking coffee on the 2 spacious balconies, or sitting out in the evening and enjoying the sunset. 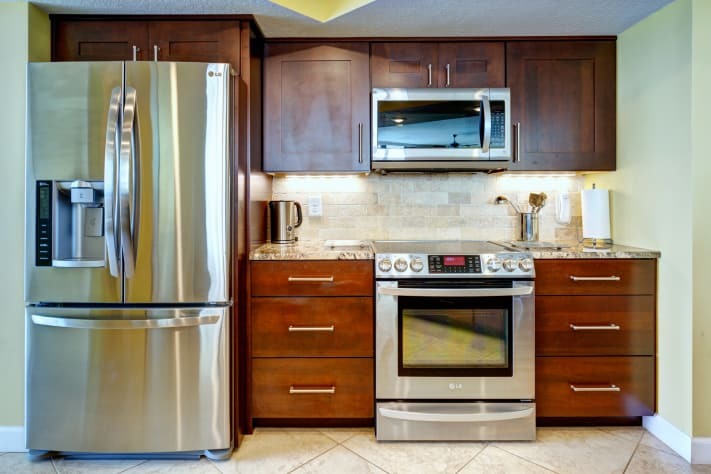 The luxury of this condo is amazing, beautiful decor, spacious, top notch appliances, extra refrigerator, tv's in every room, all the amenities needed for our stay. The Water taxi is very convenient and took us over to the harbor where we enjoyed dinner at Harbor Docks. Rented a pontoon boat and went to lunch at Dewey's on the Bay and floated around at crab island. Also had a wonderful anniversary dinner at the Beach Walk Cafe. If you want to stay somewhere quiet and first class this is highly recommended. The owners are easy to work with and very nice. Look forward to our stay next year! Recommended for: Families with Young Children, Age 55+, Romantic Getaway. Just spent a week in this luxurious condo. We vacationed with another couple but had more than enough room for each of us to have "our space". Beautifully decorated with first class décor and furniture and so very comfortable. Outstanding views from all of the many balconies with views of the boats going out for a day of fishing the morning to awesome sunsets in the evening. Had all the comforts of home including a second refrigerator in the spacious laundry room. Out of the many condos we have stayed in all over Florida, this was absolutely the best. Catherine was once again wonderful to work with and very accommodating. We loved it and will definitely come back again. Enjoyed a week in this fantastic condo. Beautiful, quality décor yet comfortable and inviting. The beds were extremely comfortable and the bathrooms were spacious and luxurious. 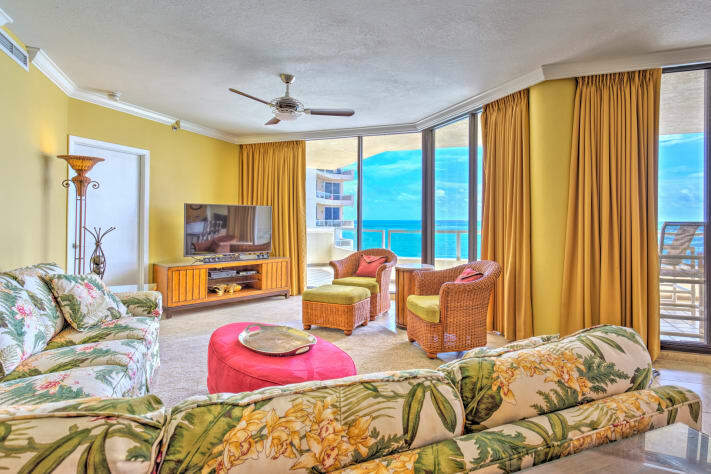 Condo was stocked with everything you could possibly need, plenty of dishes, cookware, towels, blankets, even water toys and beach chairs and umbrellas. Utility room with a full-size washer and dryer, an extra refrigerator, and more storage space was very handy. 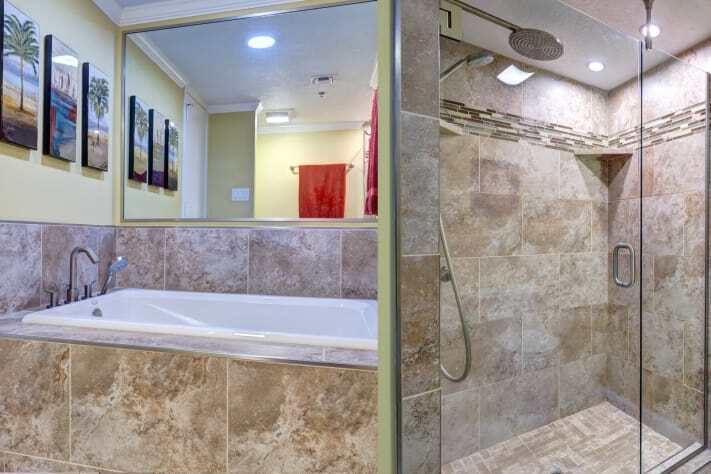 Our son, his wife, and our toddler grand-daughter joined us for part of the stay and the layout of the unit was very nice as the master bedroom is on one side of the unit with the living, dining, and kitchen areas separating it from the other two bedrooms and bathrooms. A very nice set up for privacy when staying there with a group. 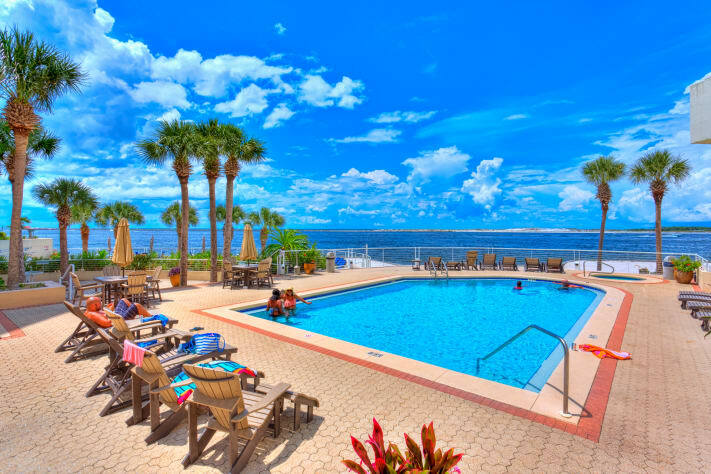 We've vacationed in various condos in Destin many times and this unit was by far the best we've stayed in. The location is perfect, quiet and not high traffic, but yet close to everything. We used the water taxi multiple times and that is a fantastic convenience for getting over to the Harborwalk Village and restaurants, picks you up and drops you off right outside the complex gates. But without a doubt the best feature amongst so many outstanding features were the balconies. Two huge balconies overlooking East Pass and even a view of the Harbor. The views were totally breathtaking. Sat out on the balcony every morning enjoying our coffee and watching the parade of boats go in and out and even saw dolphins swimming in, view of the sunset in the evening was perfect. This condo is worth every penny and I would highly recommend it to anyone considering it.....you won't be disappointed. We definitely hope to return!! My husband and I shared this lovely condo with my daughter, her husband, and their two toddlers. This was the perfect place to share. There are two masters in separate living layout. They were close to the girls' room, and we were on the complete opposite side of the condo allowing privacy and so much space to spread out. The bathrooms are wonderful in their decor and luxurious . The laundry room is such a nice addition so that we were able to wash our clothes before we left and just unpack clean clothes when we got home. The kitchen was great with all available conveniences. The views are just simply gorgeous. We consider ourselves "foodies" but we just couldn't drag ourselves away from the balconies to go out for dinner. The location puts you right near anything you can possibly need...fun, dining, adventure activities, golfing, sailing. We felt very much at home and never wanted to leave. We absolutely loved it. I am extremely picky when it comes to maintenance and the property management does a superb job keeping this place clean, clean, clean...and everyone is extremely friendly and helpful. We will return as often as we can. It was a great experience. I miss it already. The owner was easily reached for any questions or concerns. Go For It! You won't be disappointed. 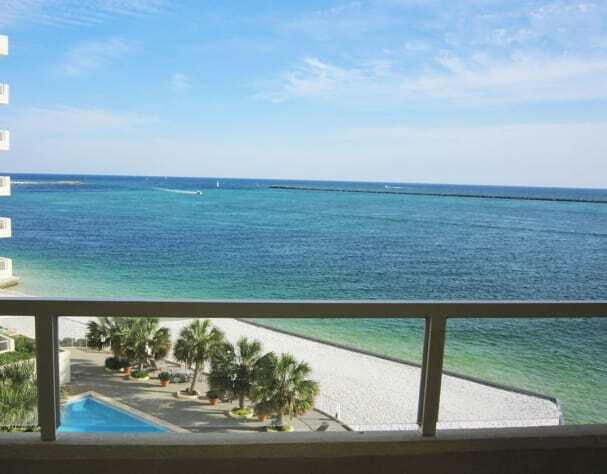 We have been in several condos in the Destin area, this being the best. My wife, four children (age 22, 19, 11, & 7) and two of the older children's friends, were all completely satisfied by the décor and spaciousness of the unit. It had been updated to today's standards (beautiful!!). Very comfortable. The balconies were more than ample and appointed with comfortable patio furniture. We loved the additional refrigerator in the laundry area. With a large group, it came in handy. Our first time in the pass, but not our last!! Location, location, location :) Loved everything and definitely will be back to very same spot!! Applaud applaud!! Thanks for the memories :) !!! Recommended for: Families with Young Children, Sightseeing, Romantic Getaway, Families with Teenagers. There were two huge balconies with different views that were incredible. The condo was beautiful and spacious. It was supplied with everything we needed and more. The whole experience was wonderful and I would definitely go back. We had a wonderful stay at this condo. It was really large with 2 dens and the pictures just do not do it justice. Each room in the condo has a beautiful view of the pass. 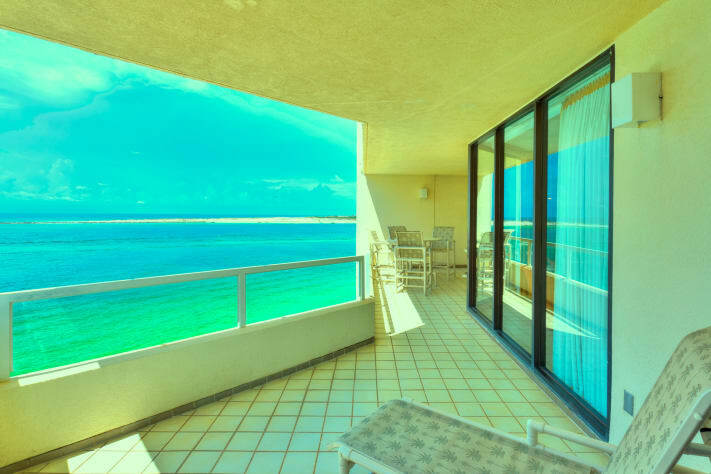 You can stay in the condo and have a great beach view from any spot. The beds were very comfortable! The kitchen was well stocked and we loved the view from the balcony! All in all probably one of the best places to stay in Destin. Although the property looked great on the internet, we were taken away by the beauty of the condo when seeing it in person. It was much more than we had imagined. The furnishings were sensational, the condo had everything we needed and more, and the view was breathtaking. The property was spotless. The owner responded quickly to any question we had. It was a pleasure talking to her. We would highly recommend this property. Also, there were many restaurants in the area; Bubba Gump Shrimp, Joes crab shack, Olive Garden, Carabbas, Outback, Fridays, Applebees and much more. The outlet was close by, next to the Bass Pro Shop. This was a vacation we will never forget. Also, my better half says the fishing was exceptional. Plenty of deep sea fishing charters to choose from.